Murudeshwar is a town located in Uttara Kannada. The name Murudeshwar also means ‘Shiva’ the Hindu god. 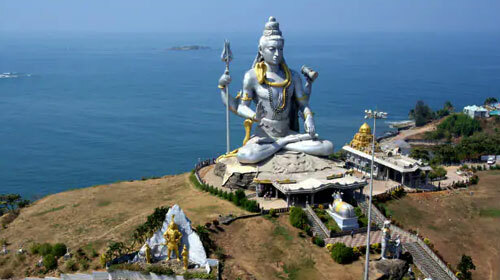 This place is famed for the world’s second largest Shiva statue and the Murudeshwar temple which lies in the coast of the Arabian sea is dedicated to Him. The temple is located in a place which is surrounded on all three sides by the sea and was built about 500 years ago. The Gopura is a 20 storey structure and an escalator is provided for a breathtaking view atop the Gopura where one can gaze upon the world’s second largest Shiva statue sitting on the coast which is 123 feet tall. The Demon king Ravana did penance at Kailash to gain immortality by obtaining the Atma-Linga from Lord Shiva. If Ravana obtained the Linga he would wreak havoc in all the three worlds. Hence, the Devas decided to stop this but they were too late as Ravana had already obtained the Linga from Lord Shiva under the condition that he should not place the Linga on the ground till he reaches Lanka. Knowing this, the Gods hatched a plan to stop Ravana. As Ravana was carrying the Linga towards Lanka, the sun suddenly started to set and he thought that it was evening as he had to do a Puja to Lord Shiva every evening. But not knowing where to keep the Linga, he was struck. Suddenly he saw a young brahmin boy coming towards him and asked him to hold the Linga while he did his puja. The boy was none other than Lord Vinayaka in guise who said that if the Linga becomes too heavy for him he would call Ravana three times before he would drop the Linga on the ground. So immersed was Ravana in his prayer that he did not hear the boy calling his name. After the third time, Vinayaka kept the Linga on the ground and went away. After Ravana returned and saw the Linga on the ground he got very angry and tried to lift the Linga with his hands due to which they broke into four parts and fell on different places. One of those places is Murudeshwar. The eight day Brahmmotsavan, Maha Shivarathiri, Navarathri and the Karthigai Deepam festivals are celebrated here with special pujas. The temple also holds other days like the full moon days (Pournami) and the no moon days as special.